Cedar, Crow, and Moon: Reading: What is holding me back? Reading: What is holding me back? Intro: Querent is preparing to change careers. Education, training, and other practical steps are already well underway. There is hesitation in making the transition. Question: What's holding me back? Is there something I need to look at before I jump? Spread: Celtic Cross, the only thing to note is being left handed I naturally see the position 2 card as being upright when facing the left and reversed when facing the right, which is opposite of the "traditional" reading but it's just how I see it, so my interpretation is based off how I see it. Position 1, Heart of the Matter: Page of Wands, youthful, innocent energy. The core of your drive in moving forward is an honest, youthful energy and a spirit that works hard. Position 3, What's below you, unconscious influences: Eight of Cups, high-emotion, big change leaving behind what you know to go forward with something new. This may be a bigger factor than you realize. Perhaps friends, social life, relationships, way of life, etc. that may change because the desired move. Take time to understand your emotions and what you feel about the changes you want to make and their impact on your life. Position 4, What's above you, conscious influences: Two of Swords, conflicting thoughts. You are very aware of conflicting thoughts and feeling but perhaps not fully aware of what they are. Position 5, What is behind you, recent past, things to let go of: The Devil reversed, something enslaving -- an addiction, a habit, a relationship -- that you have started to come out of but perhaps are having trouble shaking completely. It is likely affecting your confidence to move forward and needs to be dealt with, the more thoroughly you reach resolution and are able to put it behind you, the more free you will be to go forward. Position 7, Self image: Ten of Cups, you see yourself as enlightened, intuitive, perhaps also what is driving you in your desire for your future. Position 8, Surrounding energy, how others view the situation: Six of Pentacles reversed, there is something out of order in the energy around you in regards to effort or helping others where it is needed, either where others are perceiving that you are focused on yourself too much and not tending to responsibilities or care for others, or that your direction needs tweaking to be truly focused or perhaps more balanced between the direction you want for your life and making sure that direction deep within your heart has roots in helping others and is not out-balance in being self serving. 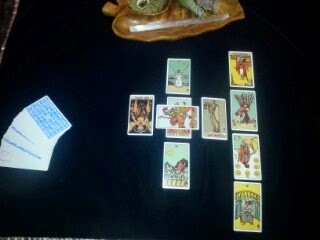 Position 9, Guidance: Ten of Wands, there are still many pieces to put in place. Be committed and direct your youthful and hard-working energy into resolving issues of the past and concerns for the future and the practical details of your endeavor. Be prepared to persevere. Any big changes to requires big energy and many parts. Be sure to seek help in each area. The Hermit card indicates a time coming up for serious solitude and reflection, but that doesn't mean you do this alone. In a balanced way, lean on friends and experts. Conclusion: The querent felt the reading matched the situation and was insightful. Feedback was that The Devil reversed likely was in reference to the fear of others' opinions, which fits very well with the rest of the reading.